UPDATE 12.03.14: The pilots’ union Vereinigung Cockpit said there will be a new strike on Thursday as a result. It will affect long-haul and cargo flights and will start at 3 am local German time (0200 GMT) and last until just after midnight. Negotiations between the union and the airlines broke off when they couldn’t agree on the retirement benefits package. 13,500 short- and medium-haul flights have been canceled so far, which is 50% of all their planned departures. The strike has affected 150,000 passengers on flights originating as far apart as Germany and South Africa and it is supposed to last until 11PM GMT on Tuesday (6PM EST). There are two issues at hand. First, the pilots want a 5% raise, which the airlines has agreed to pay. The second demand is, they want to keep their early retirement benefits, which the airline wants to phase out. Right now, the pilots can retire at 55 and keep 60% of their pay until they reach the age of 65. The airline says that’s got to go. This is the tenth Lufthansa strike since the beginning of 2014. I kind of understand how hard it is to lose something you believe is rightfully yours, and I do revere airline pilots in general, but come on–55? It’s not the 1950-s anymore. People live and work longer. Alright, enough said. If you are flying on one of the affected routes, you need to think about making alternative arrangements. I’ll admit that my singular experience with airline strikes was very positive–as weird as it may sound. I almost got stranded in Paris last year during the Air France strike. I was supposed to fly to JFK via Frankfurt, but since the CDG-FRA flight was cancelled, Delta re-booked me on a non-stop flight to JFK. That flight was otherwise ineligible for the saver award. 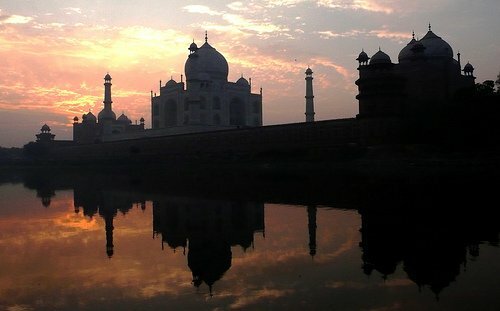 Tourists visiting India from the United States, Australia, Brazil, Germany and Japan have been added to a growing list of visitors who are able to get visas on arrival in the country. Visitors from 43 countries no longer have to queue up at local consulates, but can instead apply for their visas online and collect them at airports. I wish more countries that require visas from the US visitors started doing this. Brazil would be number one on my wish list. Seriously, I get it! Other nations feel slighted by our own high visa fees and rigid process it takes for many foreign nationals to gain access to the US. But they are hurting themselves and their travel industries in the process. Cutting the nose to spite the face–that’s the way I see it. This isn’t just any Tuesday. Today Virgin Atlantic becomes the 25th airline to fly a Boeing 787 Dreamliner, as they inaugurate their new arrival with flights between London-Heathrow and Boston-Logan. 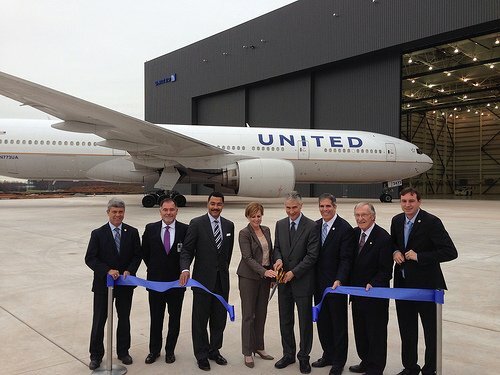 This isn’t just any 787, either. Virgin Atlantic is the first European airline to welcome the longer, cooler 787-9 to their fleet, and they do so on their own 30th birthday as an airline, hence the aircraft’s name, “Birthday Girl” G-VNEW. 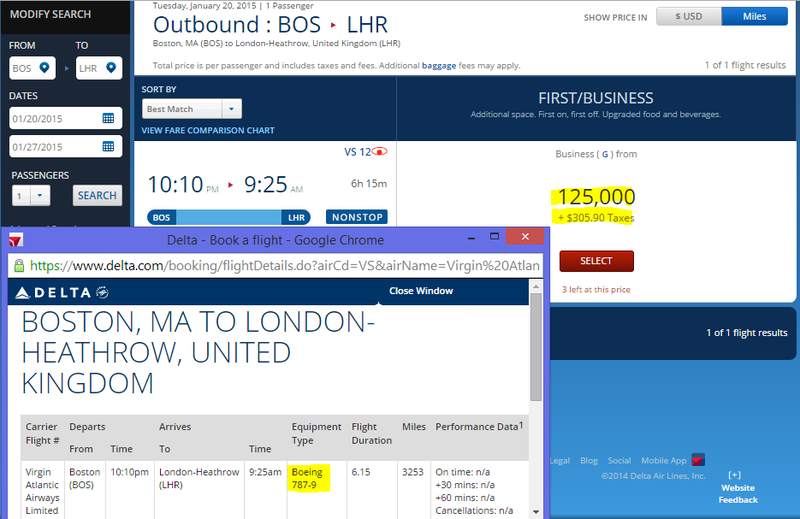 Of course, the huge elephant in the room is how easy it is to book the new 787-9′ Upper Class on a Delta award (I would like to remind everyone at this point that Virgin Atlantic adds ridiculous fuel surcharges, and booking it with Delta miles is an excellent way to avoid them). Well, I would say, it is relatively easy. There are plenty of dates available, at least for the winter. Just look for the coveted 787-9 marking in your reservation. Read about the new features here and decide if you want to become the part of history–especially if Boston is seriously out of your way to begin your adventure. Sure, Finnair is not the first airline that has this ridiculous idea to pamper their most loyal customers (like us 🙂) with a spa experience. Thai Airways, Qatar Airways, Lufthansa, Quantas and Etihad–all these airlines offer spa facilities to their first-class flyers. There is even a lesser-known Coral lounge in Phuket that offers–well, not exactly a spa–but still excellent neck-and-shoulder massage, of which (I mean the lounge), you’ve never heard until now, I’m sure. Sauna in a lounge, however, is something completely new. Finnair has installed them in all three their lounges at Helsinki Airport along with shower suites. If you value your privacy, though, you might be disappointed. 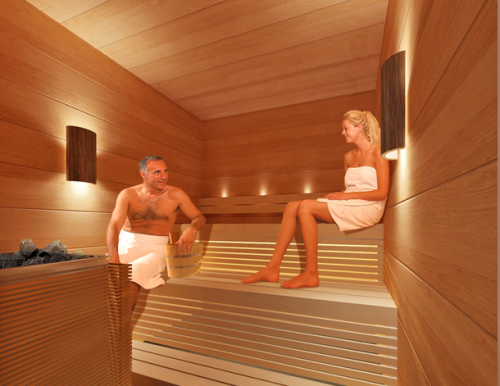 The saunas are Unisex type, although the use of towels is strongly encouraged. Or not. Want to know more about free travel hacks? Sign up for my newsletter (top left). I send them sparingly, and only when I really have something to say. In addition, there are things in my newsletters, sometimes, that I do not discuss in my blog. Those of you guys, who want to join my secret FB group, please don’t forget that you need two things. First to friend me on FB, and second to send me an email. It’s not enough to do one or another. I have other people who friend me on FB, who have nothing to do with the hobby.